Tendering and procurement for this project was handled by a process plant contractor, supplying a new special robot controlled coating plant to this Aero Engine Manufacturer. The application was for use in a clean room environment, where very precise inspection requirements are carried out on aero engine components. The tendering process called for Hoist & Winch Ltd to carry out a pre-tender survey in the clean room area in order to check overall crane dimensional clearances and maximum lifting heights possible, within the tight confines of the clean room. In addition, advice was given by Hoist & Winch Ltd on recommended electric chain hoist operating speeds and control methods, in view of the high value and delicate nature of the equipment being handled. Hoist & Winch Ltd offered a bespoke design single girder overhead underhung crane featuring a Stahl ultra-low head-room electric powered chain hoist, in 2 speed design and with reduced cross travel speeds of 10 & 2.5 m/min. Following order placement, Hoist & Winch Ltd again first carried out a Crane General Arrangement Drawing approval procedure in order to confirm the details of the equipment to be supplied and to verify the end client requirements before manufacture commenced (This is Hoist & Winch Ltd standard practice on work of a special or project type nature). This was followed by a crane manufacturing and installation timescale of 14 weeks, due to the nature of the special design and which also included load testing of the crane down-shop runway beams installed by the process plant contractor. 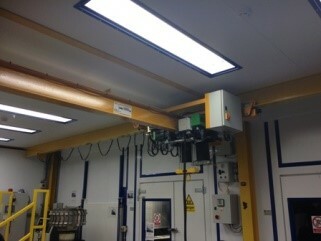 The access into the clean room area was via narrow corridors and therefore to facilitate installation, the overhead crane was transported into the crane installation area in fully dismantled form on 4 wheeled bogeys, before assembly onto floor mounted trestles in sections and then lifting into position via the use of a manual powered “Genie Lifter”. Access to crane down-shop runway beam level was via a mobile scaffold tower. On completion, Hoist & Winch Ltd issued a LOLER Thorough Examination Report for the completed overhead crane and down-shop runway beam installation work. All site installation work was again subject to very stringent planning requirements, which required very carefully documented Risk Assessments and Method Statements, which were reviewed and agreed by the Project Manager and the end client Safety Department before any work could commence.